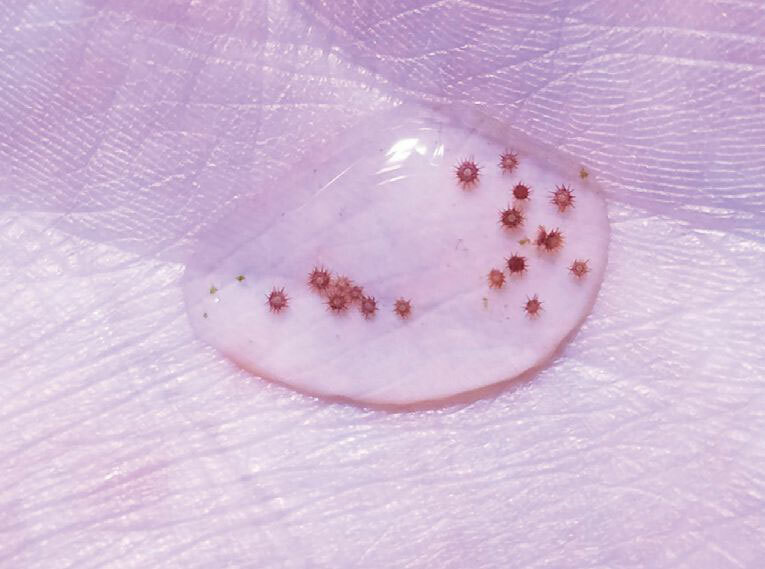 Ninety-day-old tiny, perfect, captive-bred Blue Tuxedo Urchins (Mespilia globulus) rest in a drop of water in breeder Chad Vossen’s hand. Excerpt from the March/April 2019 issue of CORAL Magazine – subscribe today! The propagation of fishes and corals is a high-profile endeavor, but aquarists seldom give a second thought to the clean-up crews—the inverts, occasionally well-endowed aesthetically, that we invite to live in our reef tanks. But, as some researchers have cautioned, little is known about the sustainable harvest of wild invertebrates. While today’s Marine Breeding Initiative (MBI) certainly supports aquarists working to breed invertebrates, nothing has really replaced the momentum generated by Project DIBS (Desirable Invertebrate Breeding Society). Some think it’s high time to bring the breeding of these often-overlooked invertebrates to the center stage. The MBI’s nearly 10-year-old database has yielded a preliminary list of marine aquarium invertebrate species that have been bred in captivity. Those original data have been augmented by insider knowledge and insights from other aquarists. The result? For the first time, CORAL is offering a comprehensive look at the captive breeding of motile tropical ornamental invertebrates for the marine aquarium hobby and trade. This list intentionally excludes invertebrates cultured as food organisms, whether for adult or larval fishes and invertebrates; you won’t find brine and Mysis shrimps, rotifers, or copepods on the list. Also intentionally excluded are those that propagate asexually (by fragmentation and division); we have focused squarely on the often-difficult task of sexually propagating marine invertebrates, many of which exist as captive-propagated organisms only as byproducts of other research or food production (for example, Tridacnid clams). This list also excludes the propagation, sexual or otherwise, of all sessile Cnidarians (stony corals, soft corals, anemones, and so forth), at least for this first year, but does include some examples of captive-bred sea jellies. In the future, the list may expand to include a proper accounting of sexually-propagated corals. It must be acknowledged that this list is incomplete; some species that have been propagated have very likely been missed. However, the hope is that this list will spark discussion and information-gathering. Please review it, then comment and share additional data that may be incorporated into a more robust offering for 2019 and beyond. Orange Common Name = Starting in 2019; all species are “new to the list” this year! Pink Common Name = Starting in 2019; all species are “new to the list” this year! Green = Commonly Available. Easy to find as a captive-bred marine invertebrate, often from more than one source, throughout 2017. Blue = Moderate to Low. Might have taken some searching, and availability may have been limited, potentially only with one source, but was reasonably obtainable as a captive-bred marine invertebrate in 2017. Purple = Scarce. Generally, only one source or breeder is known, and potentially only a handful of specimens may have been available. You may have “had to know someone” or even know the breeder directly in order to obtain them as captive-bred marine invertebrates during 2017. Black = None. The authors and consulted parties were unaware of any retail availability of this species from a captive-bred source during 2017. *This species was added after the print edition in 2018. We welcome your comments and feedback on this inaugural list. You may also wish to review the 2018 Captive-Bred Marine Ornamental Fish List, Part I of our annual recap. here are many types of marine or saltwater invertebrates that you can keep in your saltwater aquarium. From sea stars to crabs and shrimps, the possibility of finding an insert that you like is quite good. Most are kept for a specific purpose such as cleaning fish of parasites or helping rid that reef tank of algae.